All About Crane Hoists | EMH, Inc.
Wire rope crane hoists are versatile crane hoists with standard capacities of from 2 to 50 tons. 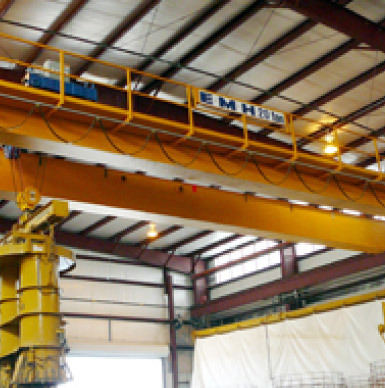 EMH manufactures both single and double girder wire rope crane hoists for standard industrial applications. These crane hoists include two lifting and trolley speeds, two upper and one lower precision limit switches, overload limit, heavy duty wear resistant rope guide, DC rectified brakes, and lifetime lubricated bearings and gear reducers. For crane hoists to serve “mission critical” Class D and Class E applications, EMH provides crane hoists with continuous, dependable operation. Our engineered crane hoists deliver a custom, modular, open winch design facilitates maintenance and repair. These crane hoists can be easily adapted for special lifts and speeds. These crane hoists operate well for capacities that range from 10 to 150 tons and all crane hoists motions are inverter-controlled for infinitely adjustable speed and prolonged motor life. Crane Hoists that are specifically designed by EMH for hazardous duty are EMH Model E Monorail Hoists. What Makes a Jib Crane Work?